The temperature anomaly or temperature index is defined as the change from a reference temperature or a long-term mean value. A positive ( negative) anomaly indicates that a measured temperuture is warmer (cooler) than the reference value. In this worksheet anomalies have been based upon the period between 1951 to 1980. 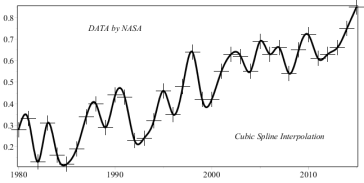 We consider especially temperature change from 1980 to 2015.